It is equipped with the range controllability and a tight pulsating effect which minnows do not have. The Tide Vib Slim is a new generation of vibration type lure with a slim form though with plenty of weight and body strength. It is up to the angler where s/he may want to use it, whether it be the pier, the surf, off the rocks, off-shore, etc. Choose your own target and we are confident that this lure will produce you results in the salt water scene. It appeals to the target through tight pulsating affects that minnows cannot create, and is equipped with a consistent and stable swimming balance at medium to fast retrieval. It responds well to jerking type rod work and provokes bites from the target through this irregular action. We have drastically reduced the heavy reeling stress frequently seen in large bodied vibration type lures. We were able to create a lure with a lighter reeling feel than the minnow, allowing anglers to utilize this lure for long durations. We have used a 1.2mm high strength wire which penetrates through the whole body. 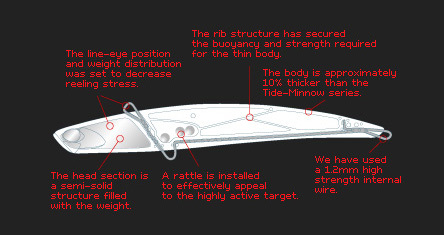 In combination with the rib design and the internal wire structure, we were able to secure the strength required while maintaining a slim and long body. 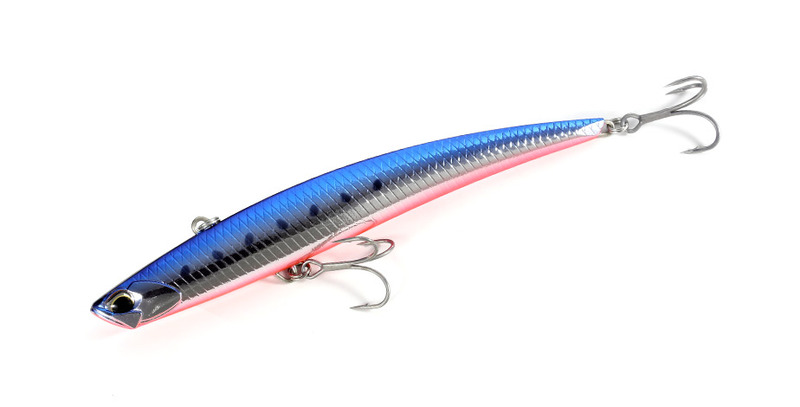 This lure will work well for not only seabasses but also for the off-shore game targeting blue runners. As its development concept was “efficiently catch highly active targets from vast fishing grounds”, we installed an internal rattle to increase its presence. Anglers will be able to search a vast area efficiently.